I prepared as much as I could of the mussel unit. I plan a visit tomorrow to pick up more white for the five bones that still need to be done. The bone is the bottom piece of the unit so can't go any further until I have the felted wool. Kanine Karnivores had a bit of progress. I changed several of the side pieces and the peak section of the lower left block. It is starting to look right, but I still need to do something with the roof of the top right block. 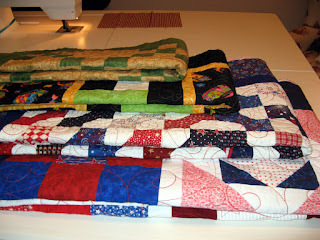 Kerry had several quilts ready for me to pick up on Saturday. I trimmed down all six. The two at the top are mine, Kringles Kargo and Kringles Kargo 2. 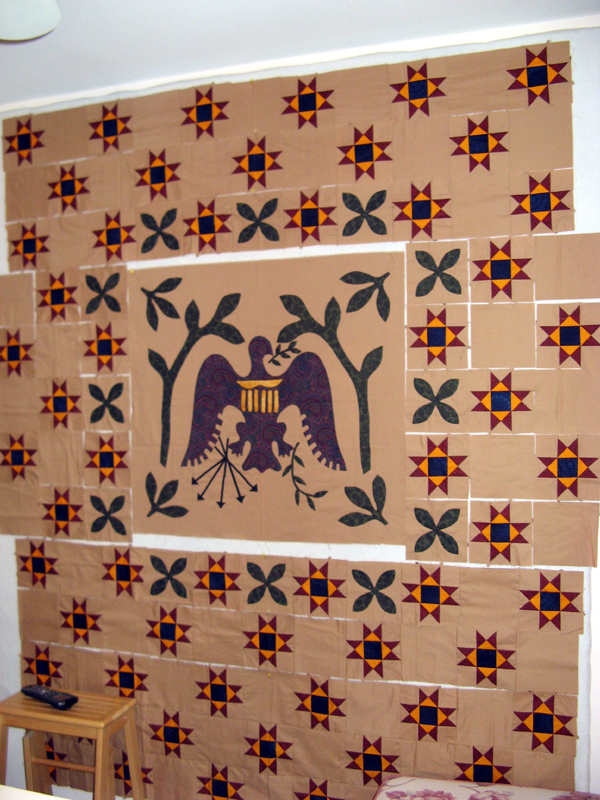 Each are just 16" x 16". 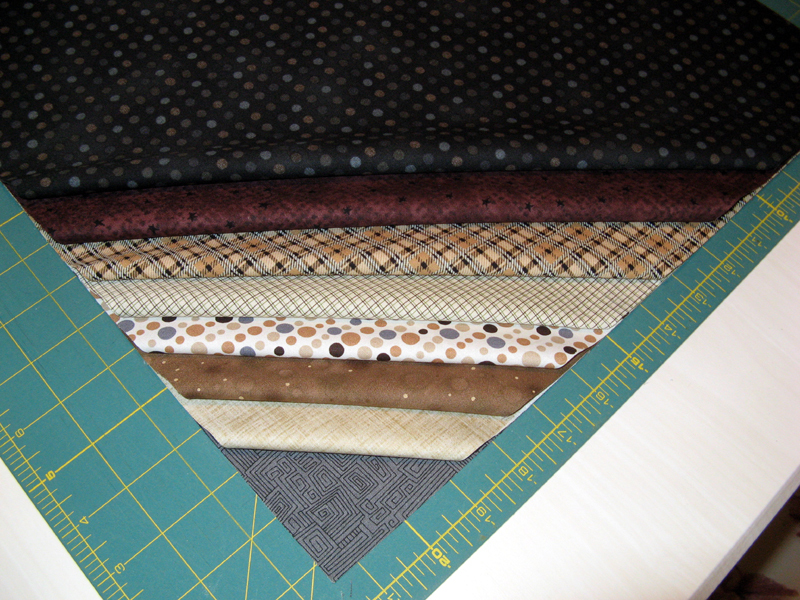 I have a couple of options for the binding for each of them. Audition time! 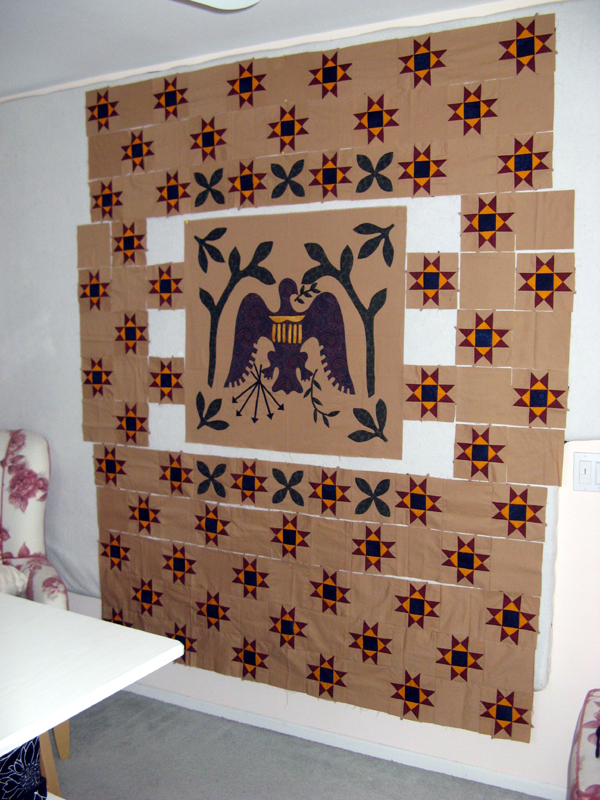 These are my Mom's projects. Most of them, maybe all of them are donations. I'll be sending them to her soon. 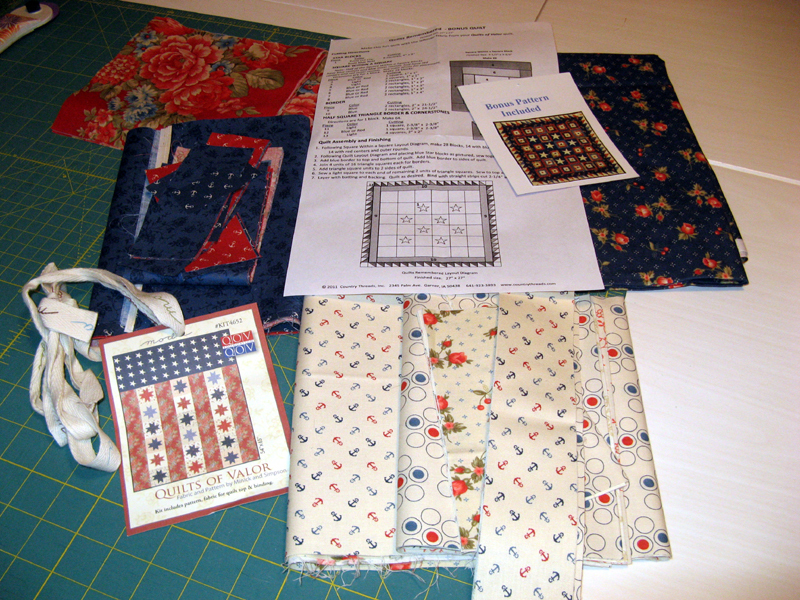 Looks like I'll have lots of binding to work on when I visit just a month from today. I will be busy with the San Diego Humane Society's Fur Ball donation this week. The plan is to have the top done and in Kerry's hands this Friday. Enjoy your week and do find time to look at some of the other wonderful projects today at Patchwork Times. This week nothing to add or reduce my stash...but I'm working on it! The design is from Buggy Barn called Nick, Knack Paddywack. 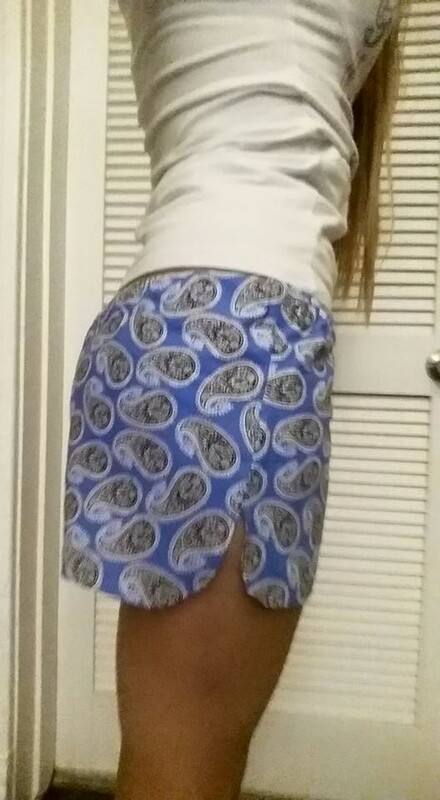 The original pattern is quite large so I've reduced it in quarters. The one above will be donated to the San Diego Humane Society's 29th Annual Fur Ball. I have three of the bone/muzzle/nose units sewn in place. They are felted wool stitched by hand with cotton perle thread. I have run out of white felted wool otherwise the dog on the bottom right would be done. I have a light tan print for the outside border. Buttons will be sewn on for eyes once Kerry puts her magic touch on the quilting. We are aiming for a completion by the middle of August. 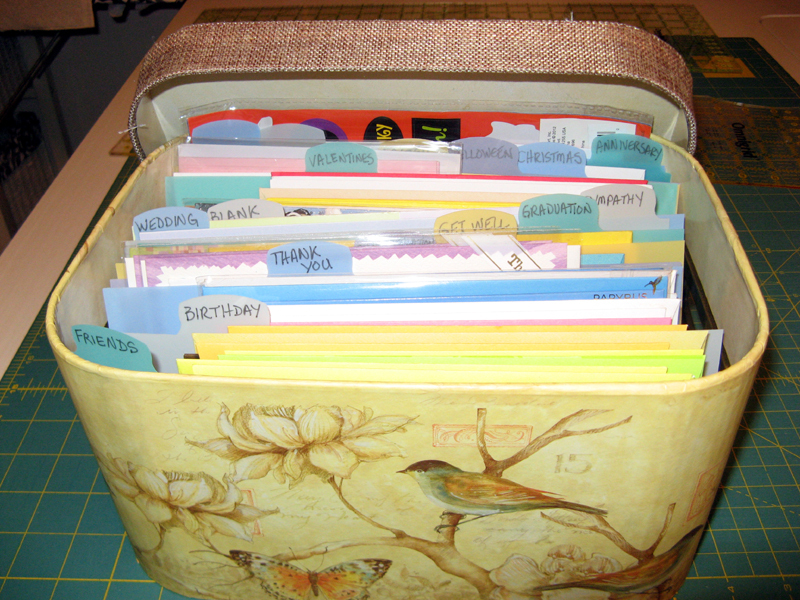 I've been wanting a nice container to store cards and now I have one! Mom found one that arrived on my doorstep. I purchased some plastic write on dividers to separate the categories. So happy now that everything is organized. Thanks Mom! Many nights this week the TV drama Outlanders has been taking up my attention just after dinner. I do enjoy this show that we are getting via Netflix. Consequently, little time has been left for sewing. Here is where I finished my night. I will make one more dog house once I determine what color combination to make it. 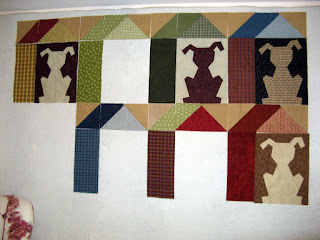 The dogs are being made still; four more to go. None of them except the one on the top right is sewn into the dog house. 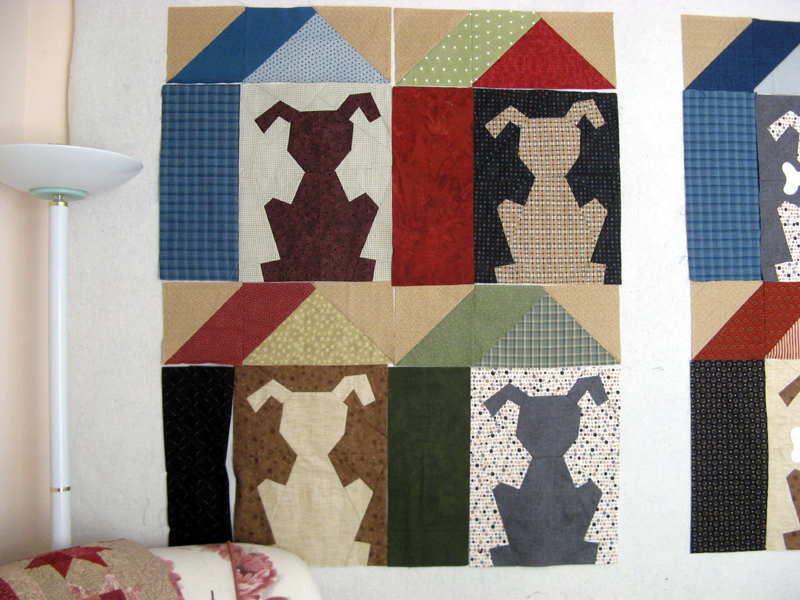 There will be some playing around with which one goes to what dog house after all eight are sewn. There will only be four dog/house blocks for each project surrounded by a border. Come back and help me figure out what should go where later this week. Enjoy your day! I received a most unexpected thank you from my niece. 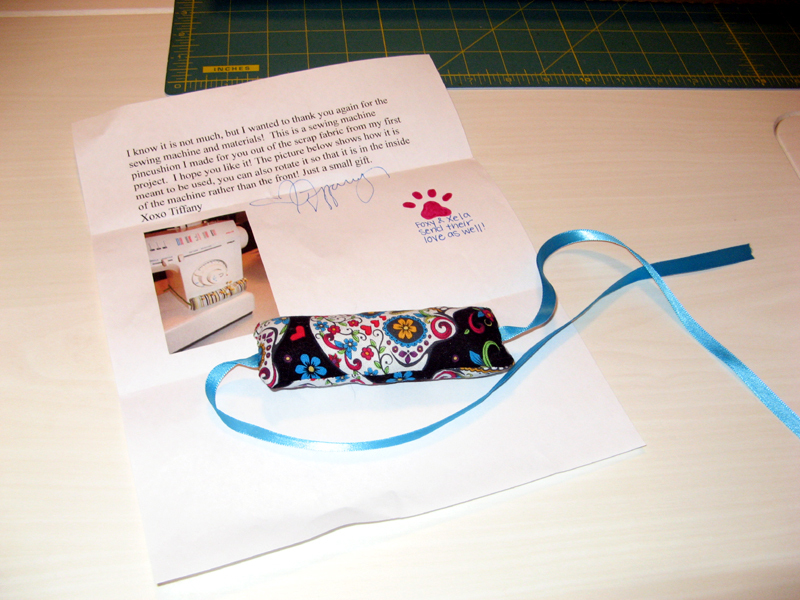 It is a pin cushion that she's made for me from the fabrics of her first sewing project. The thought has truly touched me in all sorts of ways. I am thrilled that she is enjoying the sewing machine that was for her birthday. She has certainly shown me that there are plans to use it in the future. Can't wait to see what she comes up with next. 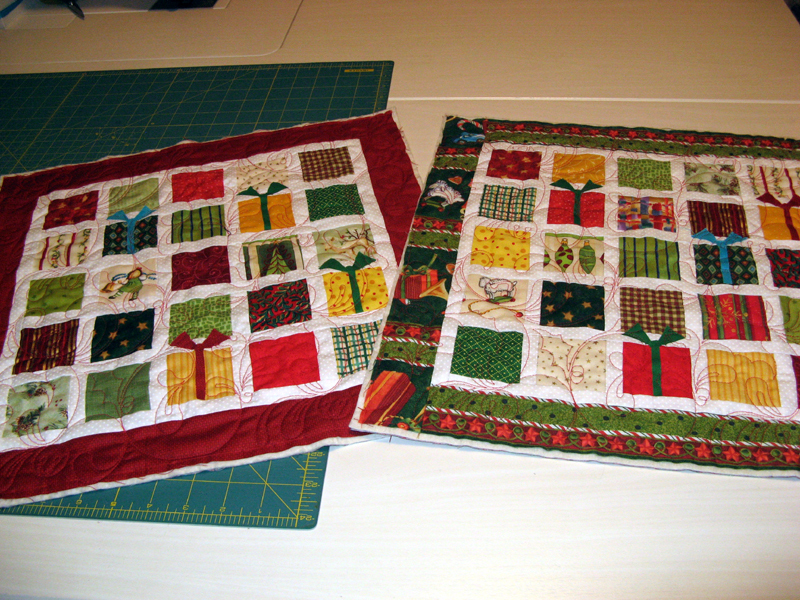 These are Tiffany's first three projects; not sure where the pin cushion fit in! Started work on the San Diego Humane Society's 29th Annual Fur Ball donation. The event takes place on August 22nd. Kerry and I thought to make this year's donation with pigs and rabbits, but a change took place... 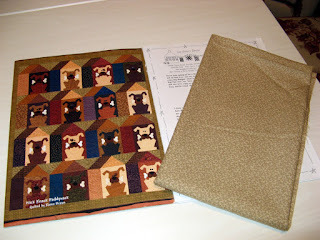 Instead this Buggy Barn pattern called Nick Nack Paddy Wack will be offered. Who can't chuckle at the great designs from Buggy Barn? It will be only four blocks big with a border. The blocks are large finishing at 29" x 23". 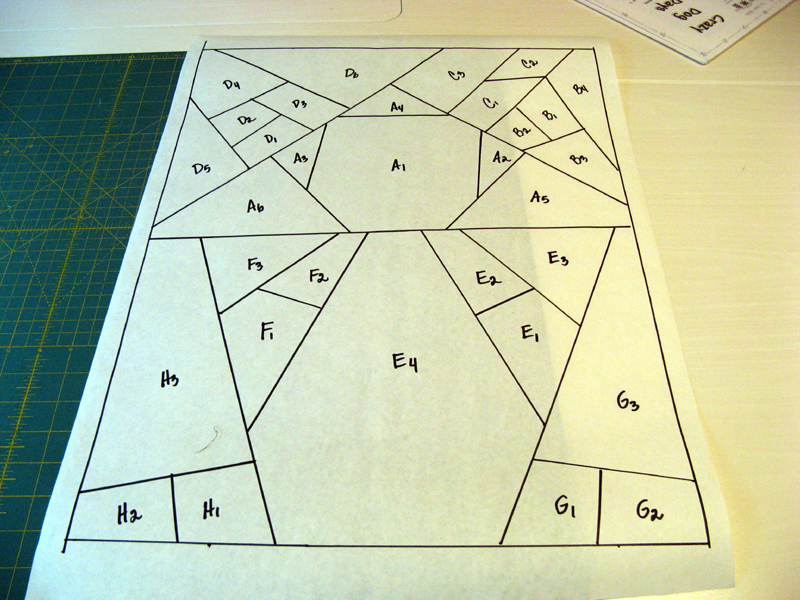 The layout will be two by two with a border. Should finish at a good size. 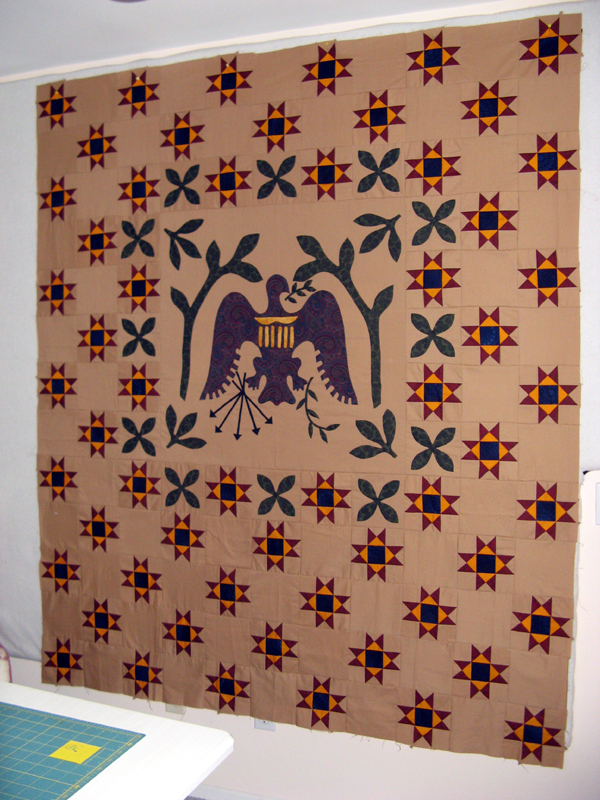 Above is the quilt in the book along with the background fabric. This photo shows the dogs and their backgrounds. All of these are the dog house fabrics. 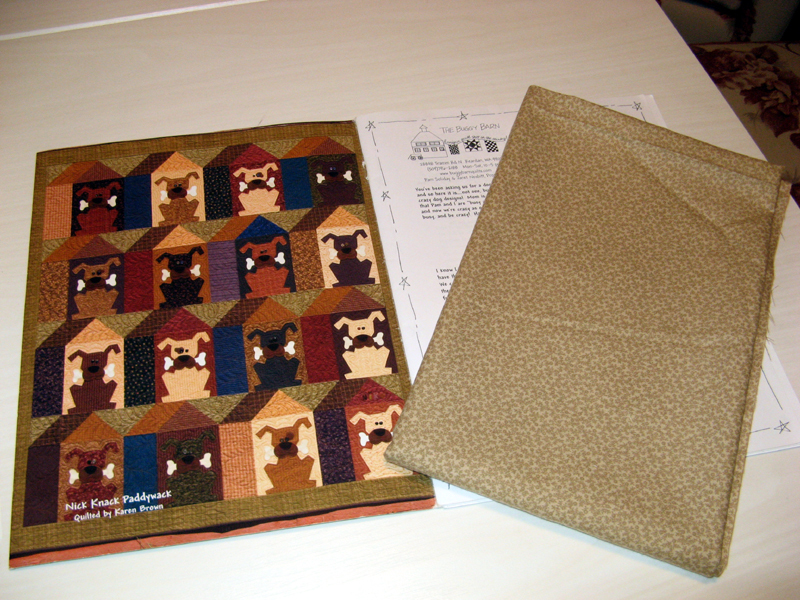 Here is the dog pattern. 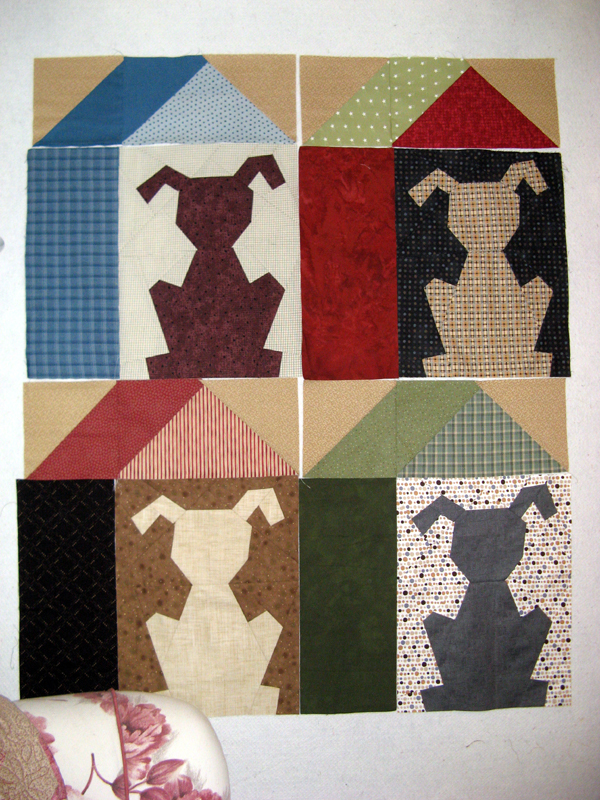 The dog houses are simple squares, HSTs, a flying geese, and a rectangle. I will be making two projects at the same time. 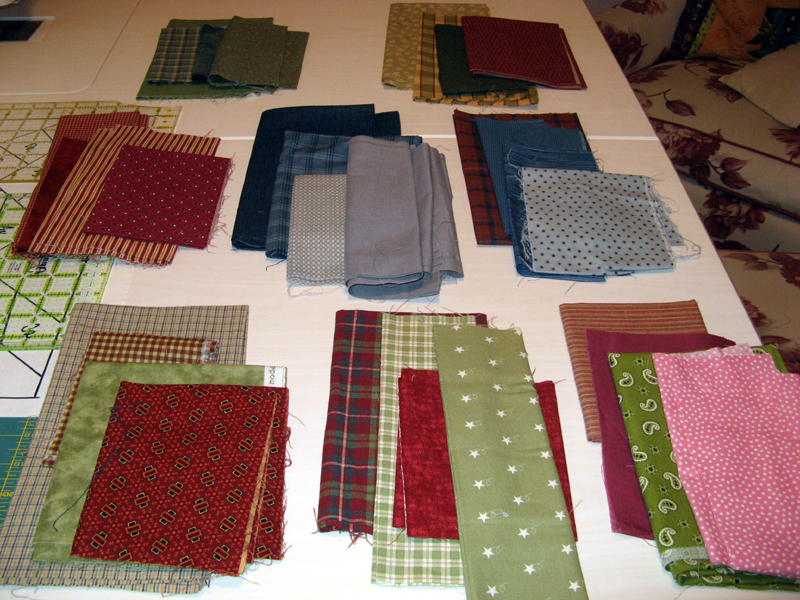 There are eight fabrics below the pattern pieces. For ease of moving the project around it all fits nicely in a pizza box. 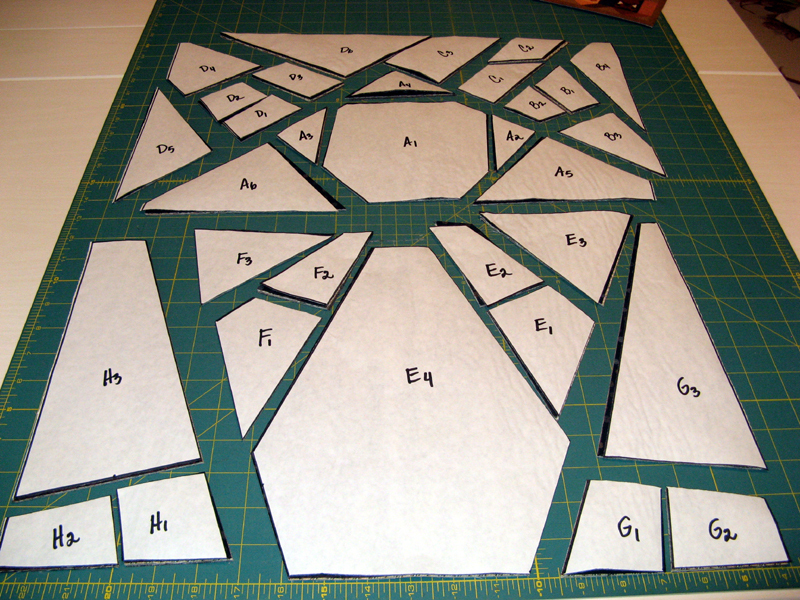 Here is block one pieced together. The eyes, nose, and bone will be felted wool stitched down by hand. That part is the last of the assembly. 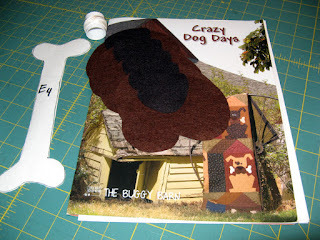 Here is block 1 with the dog house. One done three more to go! A decision will need to be made as the dogs are assembled on which four to use. 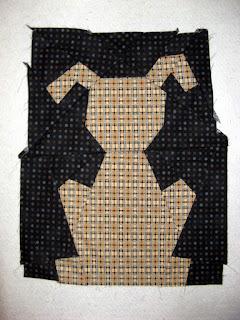 This is block 2 ready for stitching. We have enjoyed a pleasant rain the last two days. Much needed water for San Diego! 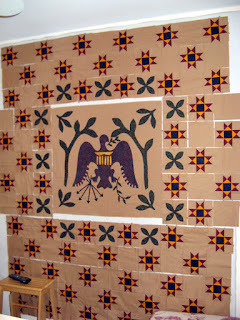 See other wonderful projects in work on the design walls of various quilters through the links at Patchwork Times. Hope you have a terrific week. 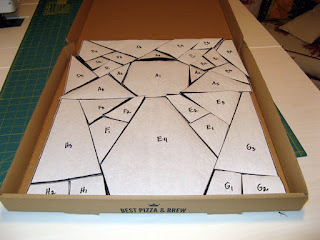 I have this project ready for Kerry. 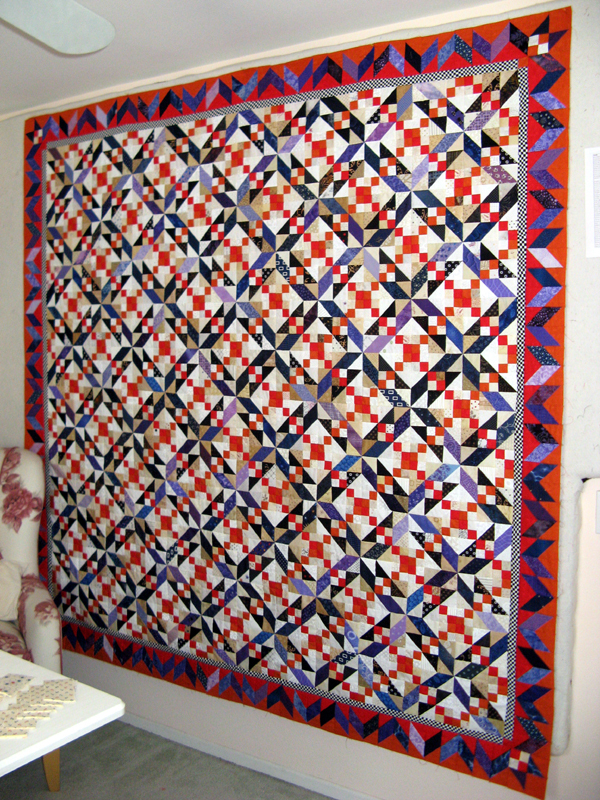 The quilt is done by the hands and machines of a few quilters. Everyone is pretty happy it is finally done. We are all in agreement that it will go to the Veterans Home in Southern Maryland once it has been quilted. For more information on this project you can go HERE. 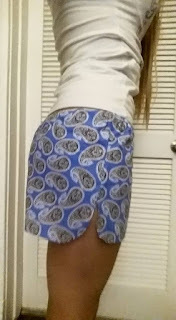 So there was a project done this week, but since no fabric was counted in I won't be counting the fabrics out. A sense of accomplishment is good too. Next I'll be working on the San Diego Humane Society's Fur Ball donation. I also plan to get started on another UFO not yet called to work on by Aunt Marti. 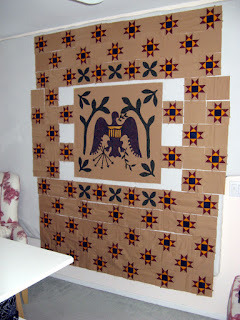 I still have a couple of large projects on my list that include two Bonnie Hunter designs, Lazy Sunday and Lady of Lake Erie. Enjoy your week. 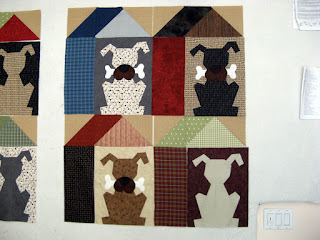 More quilters are working their stash...check them out at Patchwork Times. Did you get the classes you wanted? 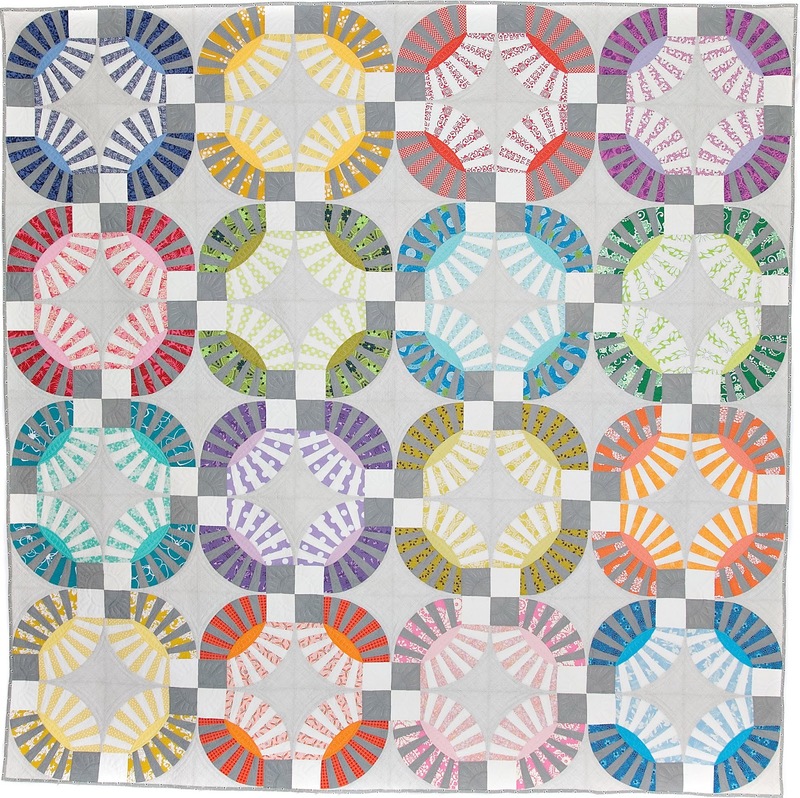 I'm writing about the 2016 Road to California Quilt Show Workshops...registration opened Saturday. These classes fill up so fast! I got into the one I hoped for YIPPEE...it is a class on Wednesday from 8am -4pm with Jenny Pedigo of Sew Kind of Wonderful. 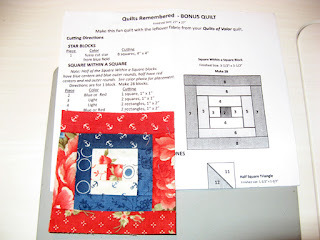 She'll show us all how to use the Quick Curve Ruler and the pattern she designed with Helen Robinson called Chic Kisses. There are classes for everyone during the week. Hope if you want to take a class you can get the one you want. I've been working on a project that at least four or five have worked on. Someone I don't know started this design from the book Quits from the Smithsonian. It is the design called All-American Eagle. 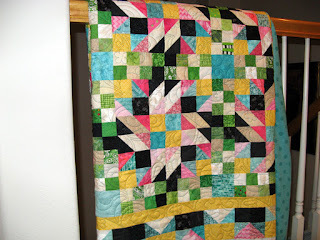 That someone decided the quilt needed to be larger and proceeded to make enough components to accomplish exactly that. Fast forward I believe maybe 20 years it comes out from cobwebs... When projects met finishes and time still allowed for more to be done during the retreat in June three of us decided to get it done. I got back the center piece about a week ago. So here is where my Sunday began. 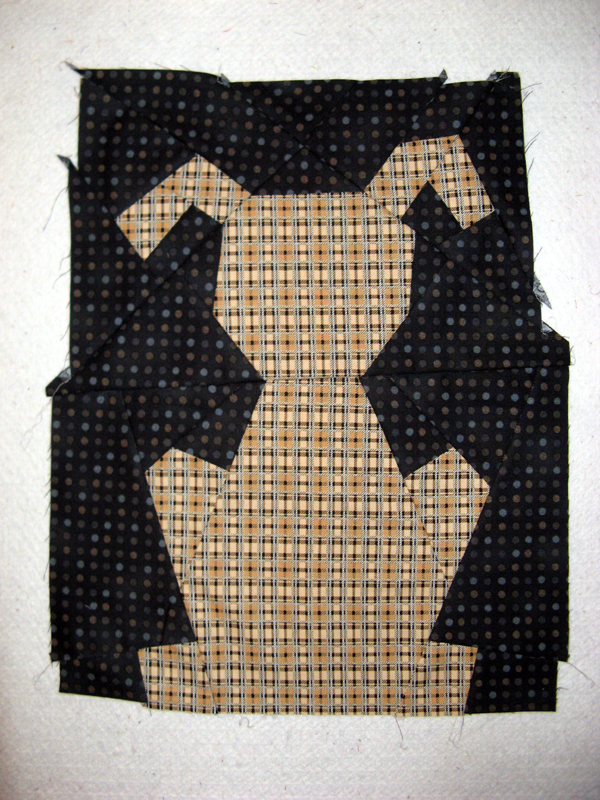 I thought I'd finished the applique, but no six more cross blocks needed doing. 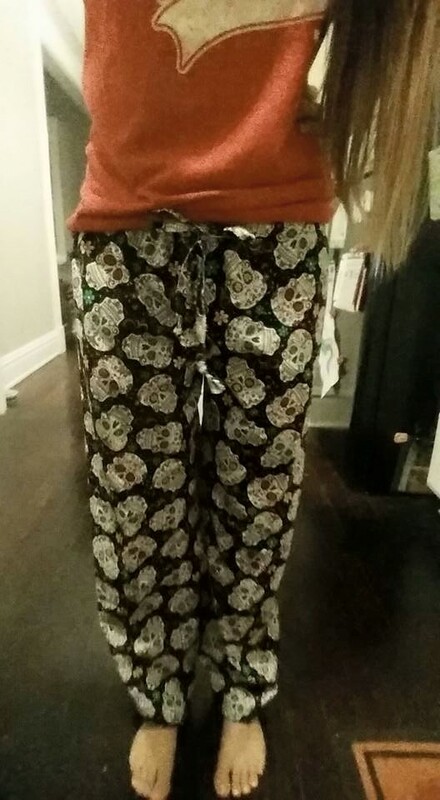 I worked on them completing the last one just before bedtime. Later tonight I'll be putting the side pieces together. 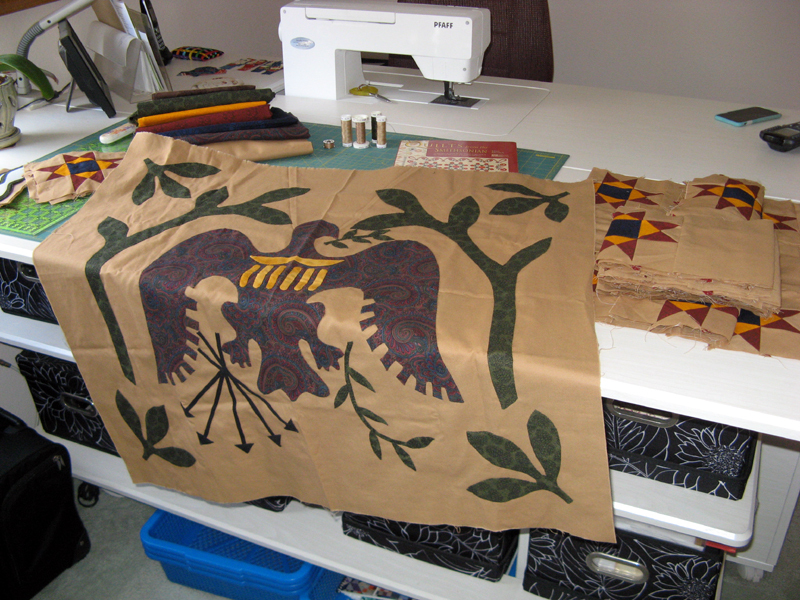 Looks like I may need to add fabric around the eagle to have it fit correctly in the space. 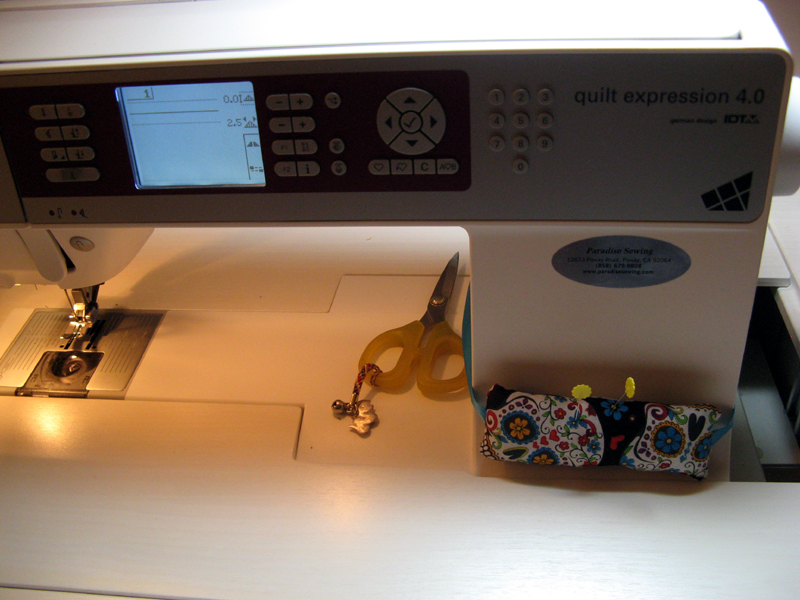 I have lots of all of the fabrics at my disposal. First things first...will I need something or not? If so, what fabric shall I use? Guess I shouldn't get ahead of myself. Now that my UFO for July is complete there is time to ponder... Hope your week goes great. 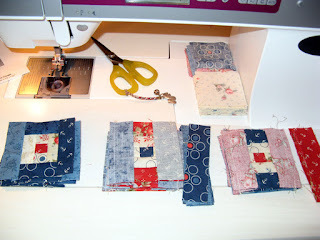 Check out more projects through the links today at Patchwork Times. July UFOs are done! I really enjoyed putting these two QOV Foundation designs together. 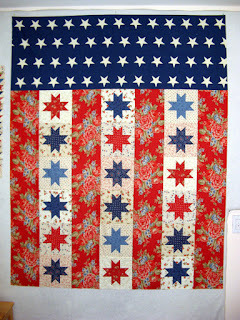 Flag of Valor above is Kit #4652. I understand that it can't be purchased as a kit any longer, but try finding it by the pattern. 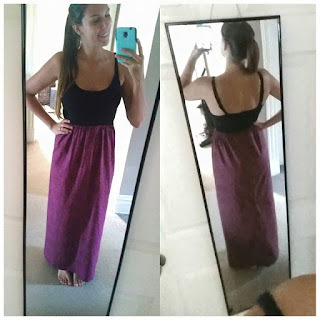 You can easily use any fabric to make it in whatever theme you choose. 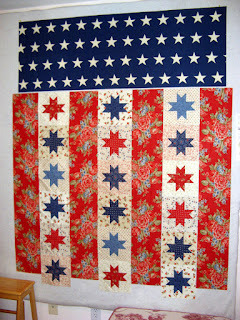 If you go patriotic you may have to be a bit flexible on the star fabric. 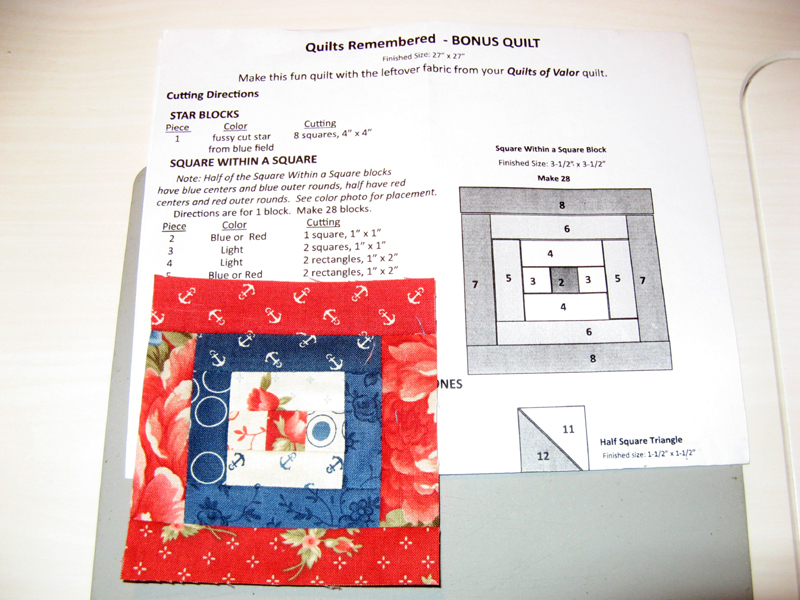 Along with the Quilts of Valor Kit came a bonus quilt design. Honestly this is the one that really interested me most. 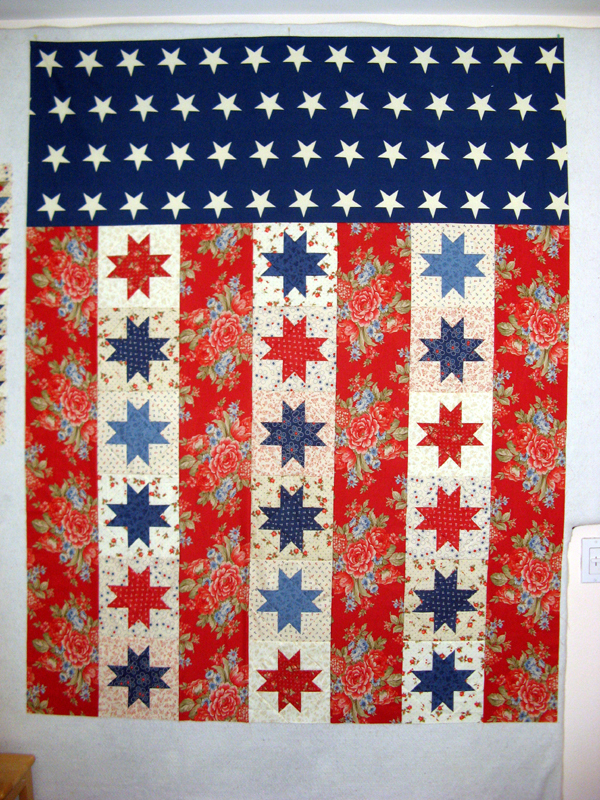 It uses all the scraps from the Flag of Valor project which is very nice. So this week I have some usage to account for. 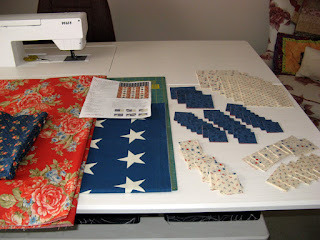 I have another patriotic project to assemble that involves an eagle! More on this one tomorrow. 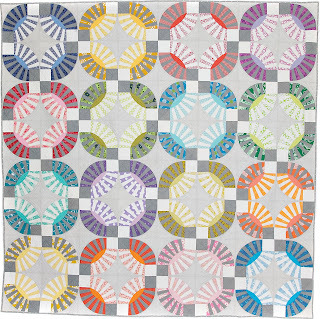 Check out other stash busters through the links at Patchwork Times. My progress so far on Kidd. 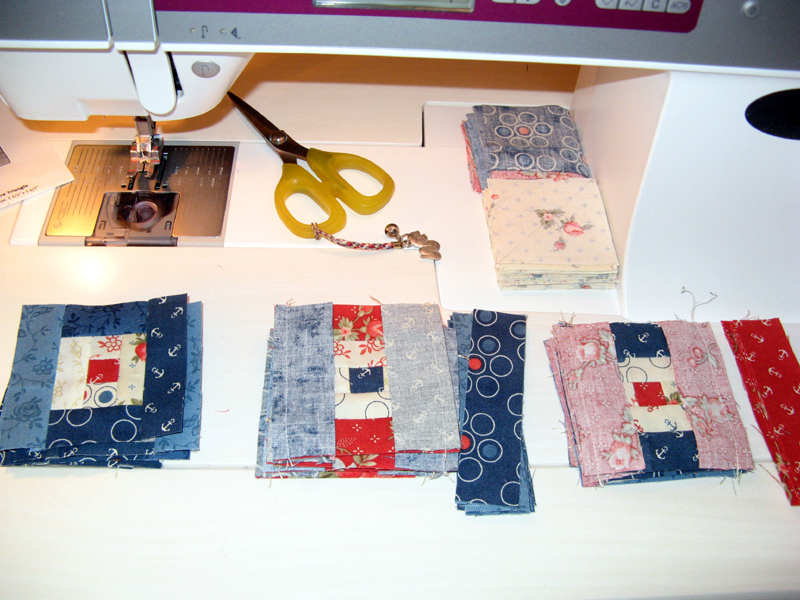 I have some more 1" x 3" strips of red to cut before I move on. 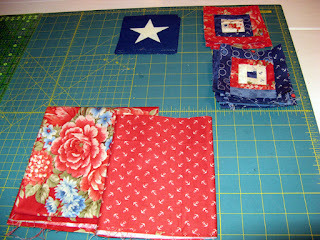 The stars are arranged among the tiny 3 1/2" log cabins. These are ready for those strips. Looks like the weekend will see Kidd moving along nicely. 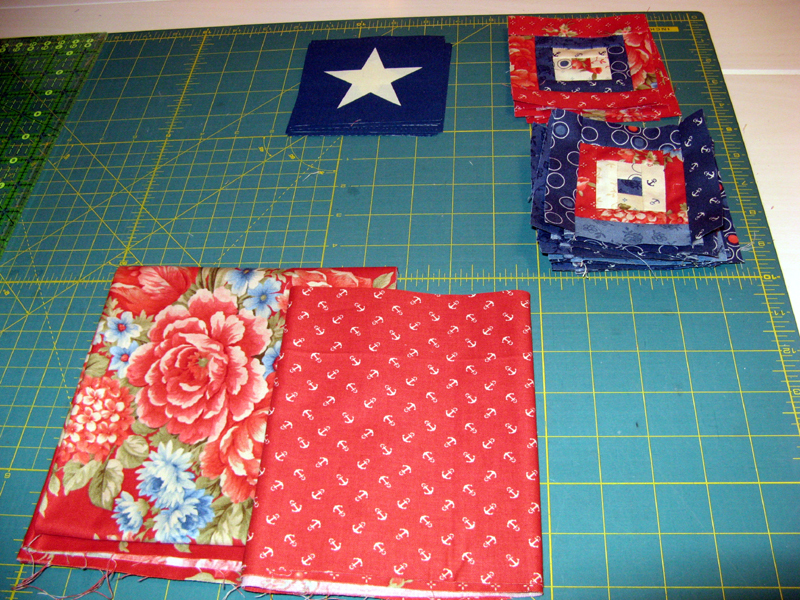 The 2" squares are to be HSTs for the border. 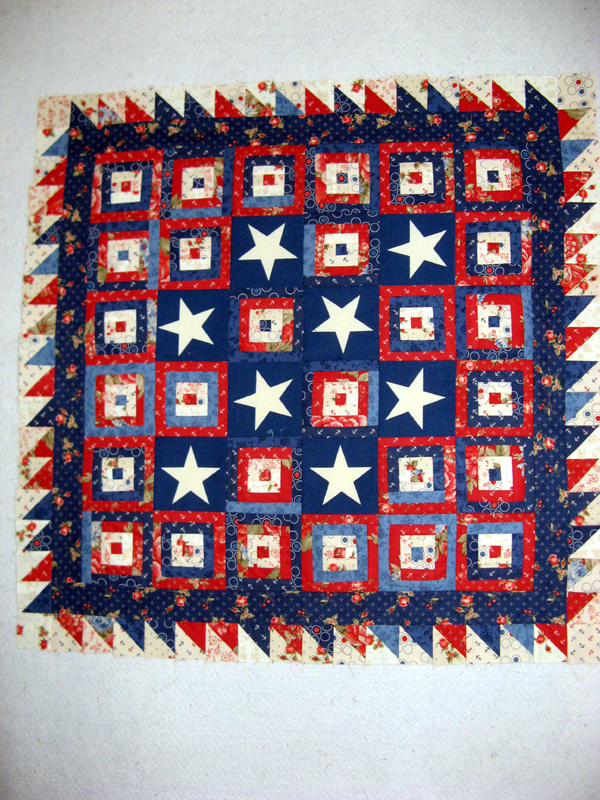 One of the finished blocks. Yes Janet this one is rather small... TGIF! Congratulations to the USA Womens Soccer Team! Koronado is on my Design Wall today. 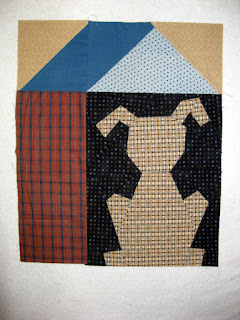 It is the first of two quilts that make up my July UFO. The second quilt uses the scraps. I plan to cut the pieces and get started on Kidd next. 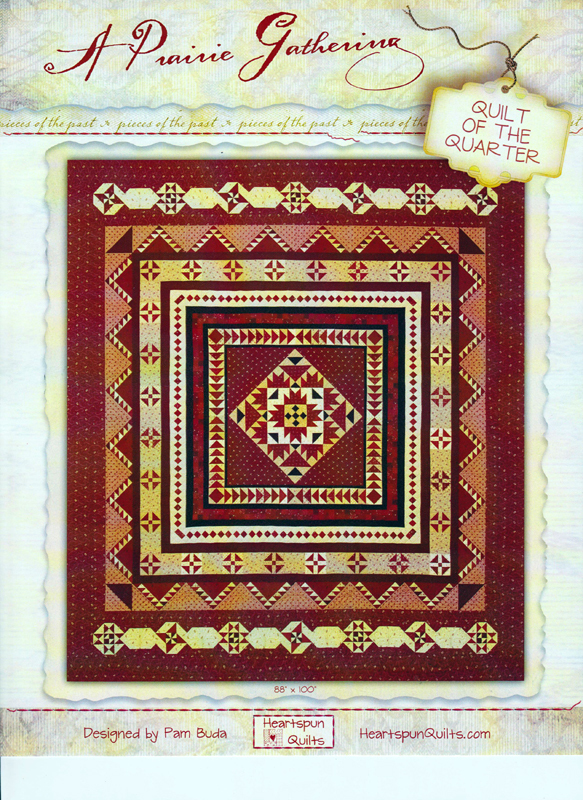 These quilts are the QOV Pattern 4652. You can learn more HERE. I picked up Kadabra from Kerry's Quilting today. 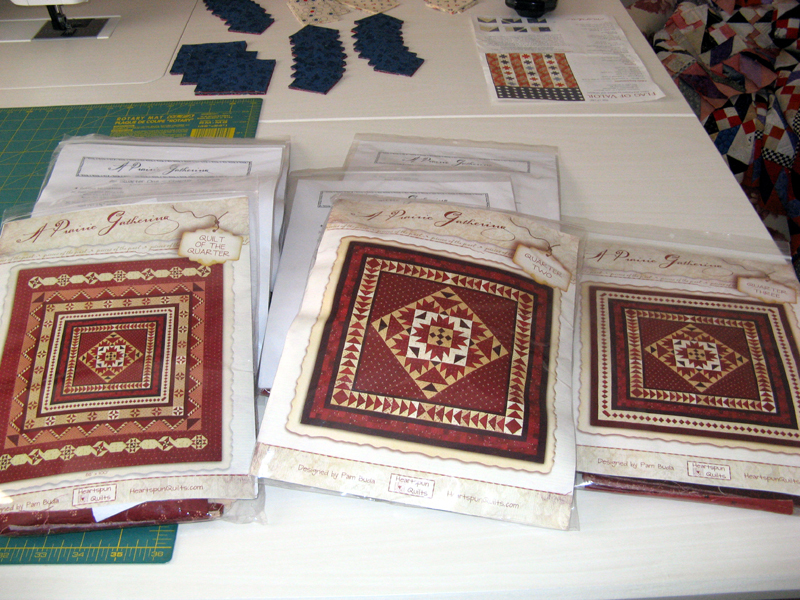 Next up is trimming, preparing binding, a sleeve, and a label. I'll have some hand stitching to do. I wonder if DH has any good Netflix in the queue? 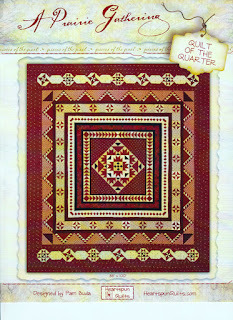 Enjoy more beautiful projects through the links at Patchwork Times. Enjoy your week! 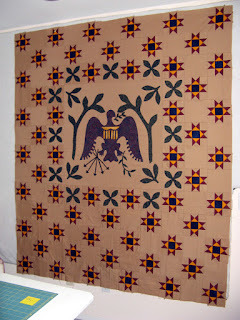 About a month ago I spotted this pattern at Country Loft in LaMesa, CA. A Prairie Gathering by Pam Buda. Kerry and I decided to jump into this kit a month project. I looked for a total yardage calculation, but couldn't find one. So I will be calculating the yardage over the week to record in the next Stash Report. We were fortunate that the first seven months were still available. 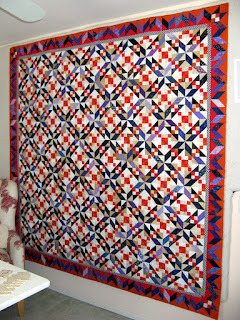 Being that it is a medallion quilt the kits each month make rounds. 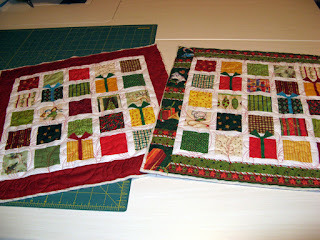 I have made a project by Pam once before and plan to take a workshop with her in January through Sunshine Quilters. It would be nice to have my project done before then. Kamikaze is finished! 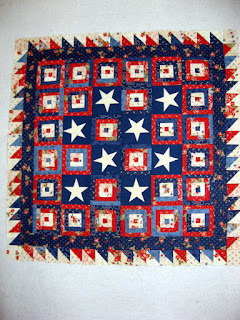 I will be taking this to be quilted a bit later today. This brings me up two future 2015 UFOs that haven't yet been called FINISHED! So nice to be ahead for months that surprise us with unexpected events. 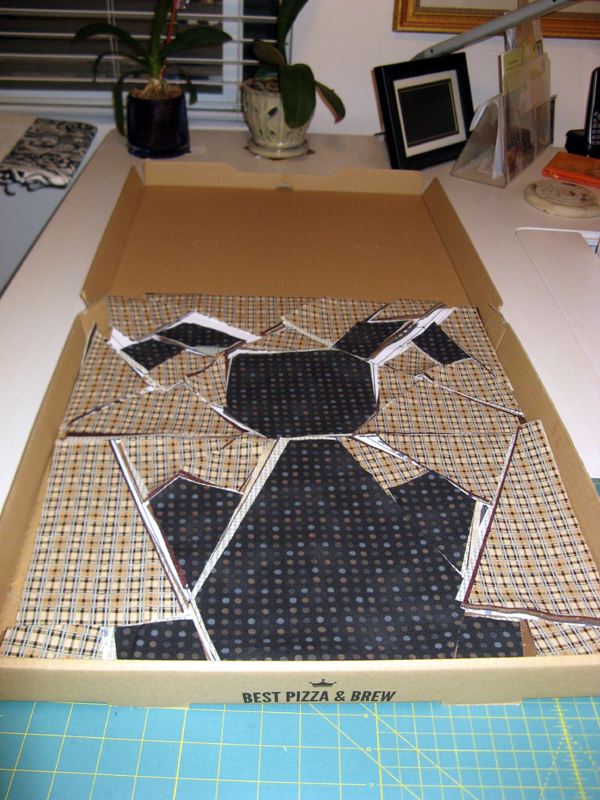 What's even better is that the two have lots of piecing!